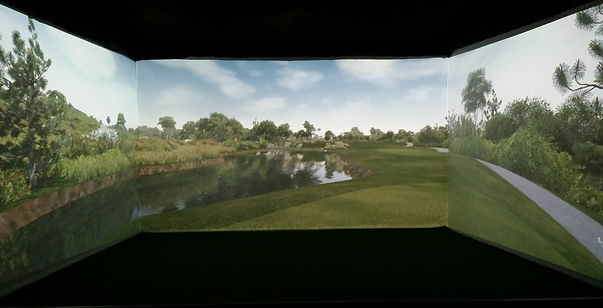 The Scarlett’s Golf Experience simulator is one of the most advanced on the market. Our computing systems use the latest high-end processing and graphics systems available. Listed below are some of the key aspects of our system. Our screens are 16 feet wide by 9 feet high… and there’s 3 of them. Complete lifelike realism. It’s hard to tell you’re not looking out your back window at the fairway. Reflections in the gently rippling lake… Trees rustling in the breeze… Clouds lazily floating by… Many people come into our store just to view the scenery. When it comes to turf, our system offers a more lifelike experience. 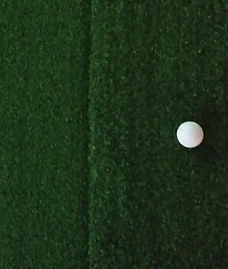 The “fairway” hitting surface has a cushioned feel… It’s more than an inch thick. You can actually place a tee in it. If you hit into the ground you won’t get that shock that’s typically felt on driving range type hitting surfaces. When it’s time to putt, we have a totally different “putting green” surface that allows for a true roll, much like a typical green. Many simulators can act as a driving range. What truly separates the best is chipping and putting. Our system is so unique and accurate that we’ve filed for a patent.